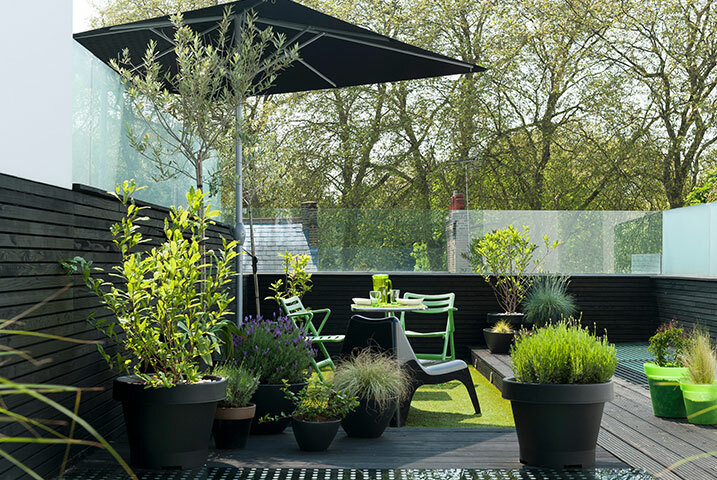 It is challenging to make the most of the space you have in a roof garden. That is why you are usually best to leave it to the experts. 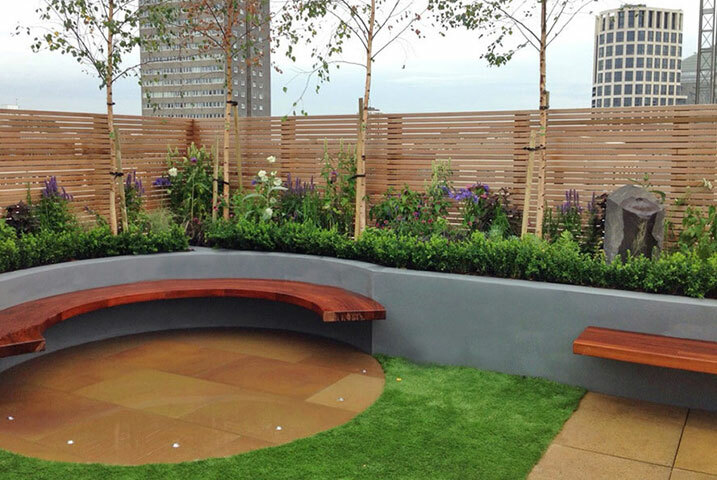 We understand the legal safety requirements and work around them to paint you a beautiful garden, which will sit comfortably but spaciously in its surroundings. Every garden designer knows that terraces can be tricky. The thing to remember is that every square centimetre counts. And all designs must be sensitive to function and use, as dictated by the client. 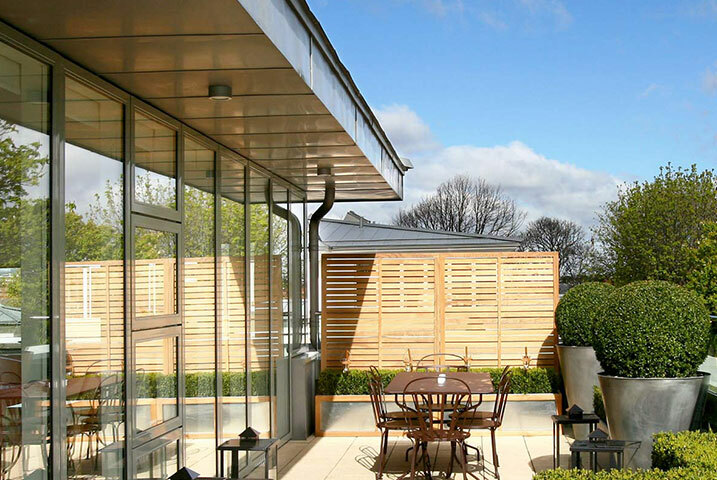 This roof terrace design prioritises space for entertaining. That means plenty of seating—both for lounging with a drink and for dining more formally at the table. the arrangement and placement is uncluttered and the choice of box hedge and topiary complements this elegant simplicity. Joints and eye-breakers have been used to emphasise the terrace width. 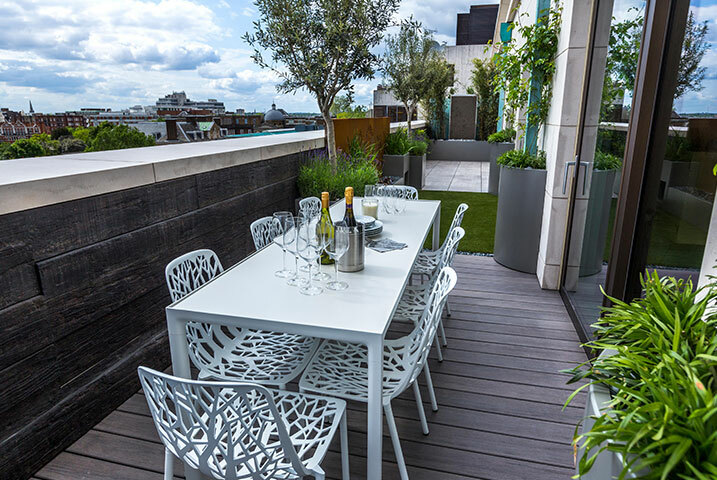 Roof terrace design in London can present such a challenge due to regulation. Load-bearing restrictions and high wind safety measures limit what we can do. But, as you can see here, floating benches are an elegant way of addressing both of these concerns. Notice how private this garden looks in spite of the surrounding tower blocks. This effect is largely down to the three-tiered planting. The breezy Silver Birch trees obscure the buildings, while perennials add seasonal colour. Meanwhile, the vibrant green box hedge provides a lush leaf all year round. Another modern roof garden designs constraint is size. Roof terraces can be small. And that means we have to make the most of the space available. Furthermore, small terrace garden design needs an even greater awareness of the surrounding buildings and landscapes. 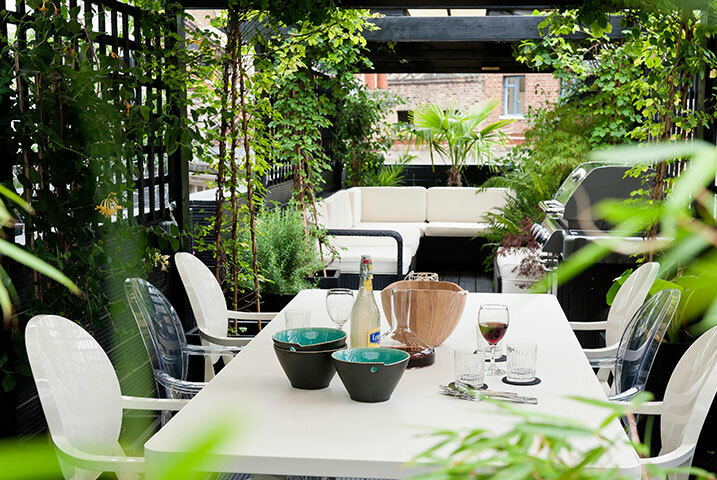 This roof terrace could easily feel too exposed without the densely planted boundary. And the choice of tall, durable steel pots enhances this sense of protection. The decking was chosen over paving because it’s lighter and allows for better drainage. Also, because this garden is close to the sea, plants that grow well in such conditions have been chosen. 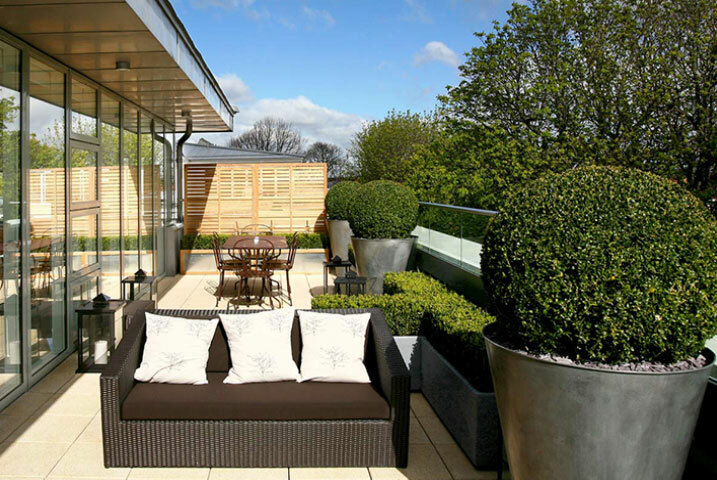 Clients often want to make the most of their view, which means we keep the terrace garden design relatively simple. It can also mean directing the gaze outward, away from the garden and out to the surrounding skyline. Here, this has been accomplished just with plants. 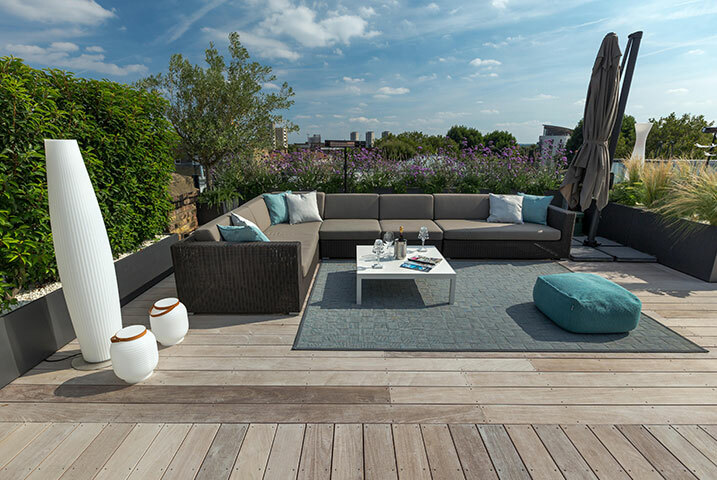 Not only are they low enough to give a clear view of the horizon, but their placement on either side of the terrace creates a visual corridor for the eye. Our choice of soft, cottage-style flowers usually helps to soften the otherwise harsh urban view. As mentioned above, long, narrow roof gardens like this really need eye-breakers to hold onto the gaze. Here, the introduced of the pot plants, which serve that purpose. By giving your eyes more to look at, they prevent you from scanning up and down the garden in a glance. And this makes the space seem wider than it actually is. 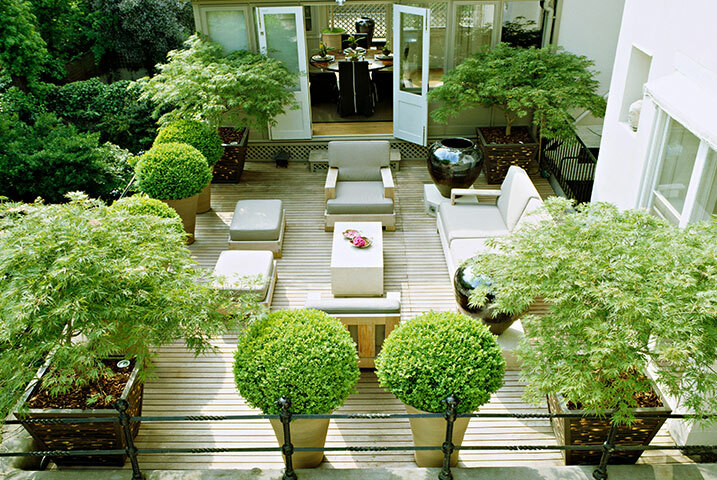 The relatively dark wood decking, meanwhile, enhances the contrast and draws attention to the green of the shrubs. adding matching wood cladding to soften—and to set this garden apart from—the walls of the neighbouring homes. Looking at entertainment gardens, you could almost imagine that your were inside a house. There’s a covered “dining room” with space for dinner party guests, for instance. And, beyond that, there’s even a sofa for all your family and friends to lounge on. Meanwhile, the trellis walls are thick with climbers and the roof sections are solid and black. It could easily feel cramped in here. But that’s exactly why there’s so much bright white. 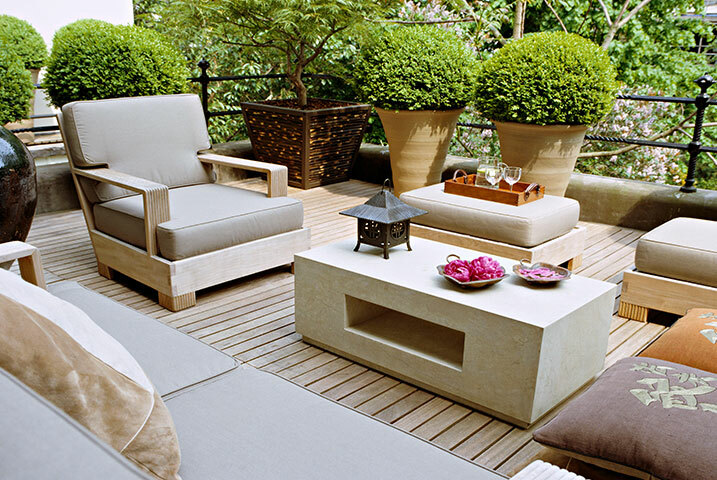 White cushions and furniture help to give the impression of space while reflecting light back into the garden. 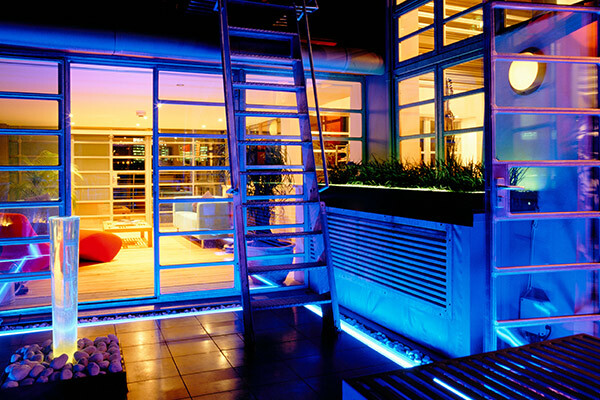 Most clients’ requirements are to create a garden that comes alive at night. 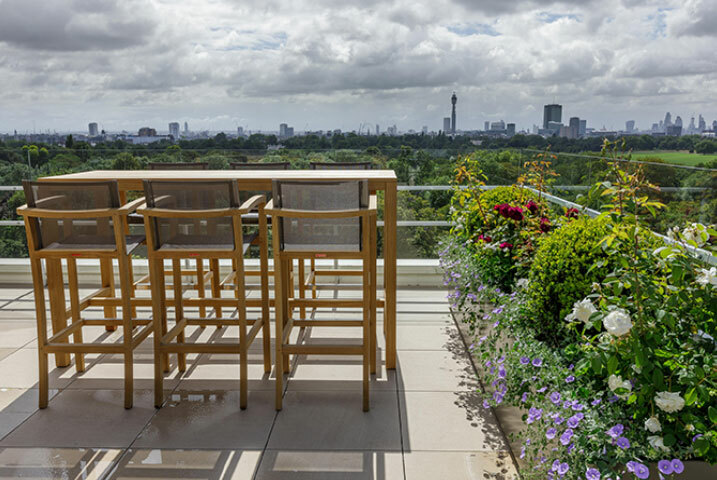 Many rooftop gardens we design in residential buildings don’t see much use during the day. The placement of lights at intervals along the length here, mostly around the bases of plants, creates an air of grace and beauty. As you can see, the avoidance of solid-backed garden chairs in favour of a more ornate, yet contemporary, open-backed design. 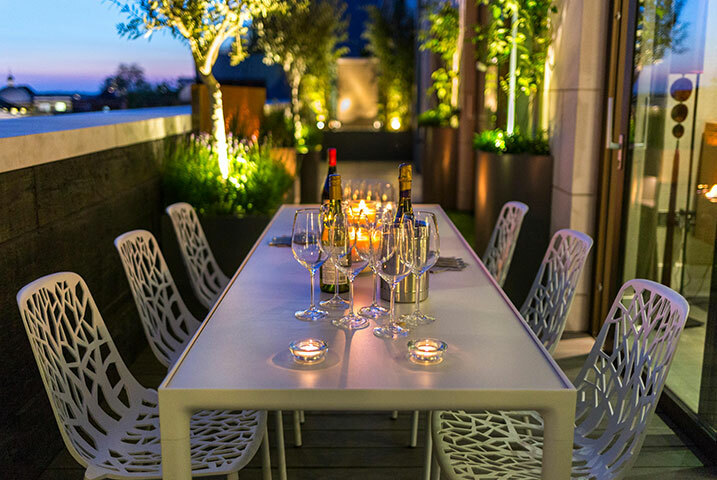 We feel that the introduction of these beautiful chairs mitigate what might otherwise be a slightly claustrophobic terrace shape. 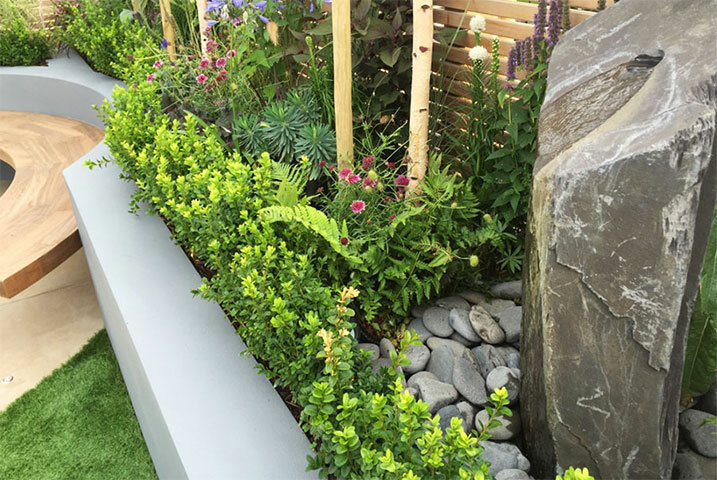 With so much hard landscape materials on display, box plants can be a practical necessity. 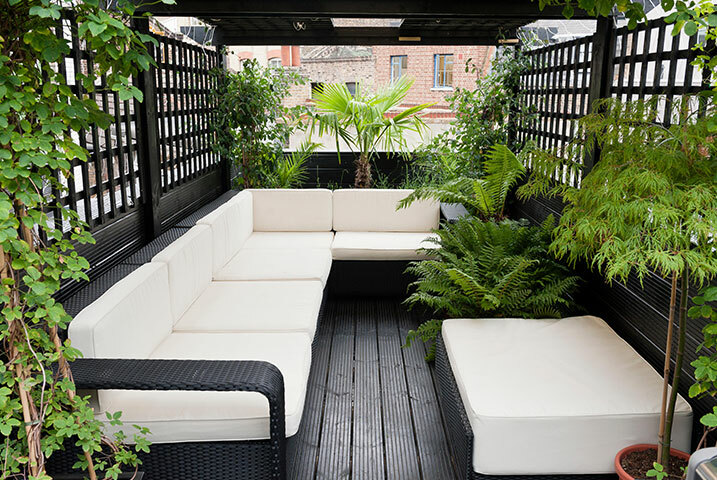 In fact, they’re great for roof terrace designs in general because there’s no need to set up any smart irrigation. Here, they provide all the luscious green that we need to balance out the greys and blacks from elsewhere in the design. And, needless to say, they soften the city view. 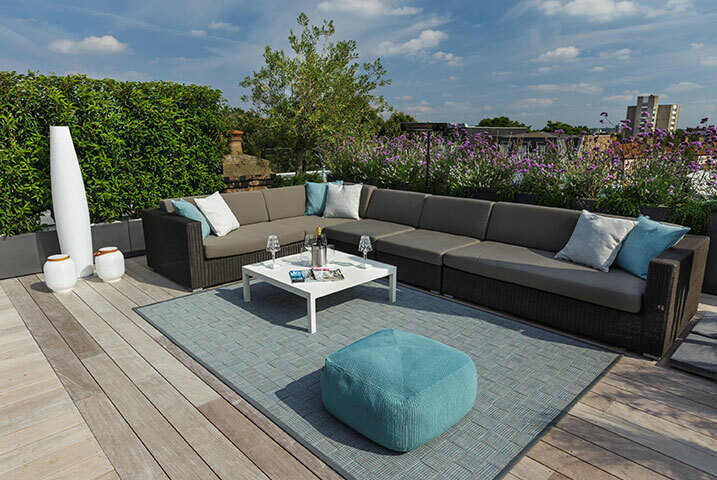 You can see why lifestyle roof garden designs is so much in vogue in London. 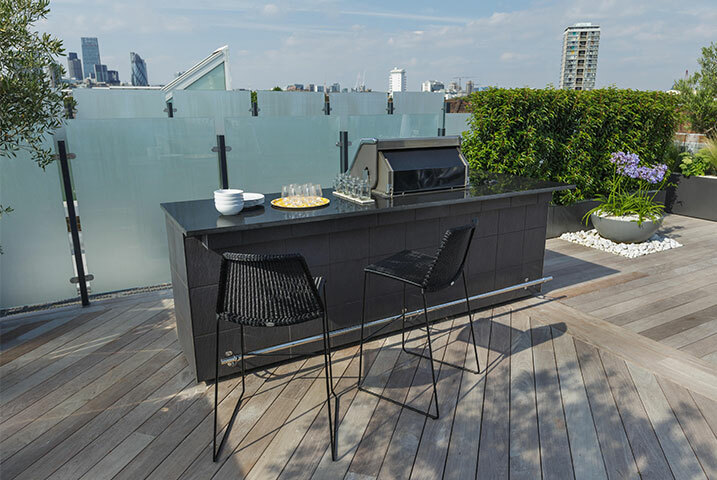 Imagine sitting around this magnificent barbecue enjoying a drink some fantastic food with your friends and family. 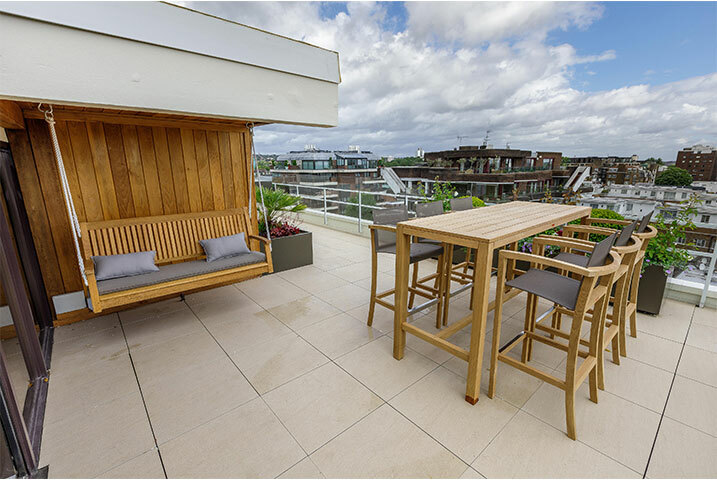 Roof garden design ideas must have sympathy for their immediate surroundings. However, this doesn’t only apply to urban roof garden design in London. It also applies to this terrace surrounded by trees. Look at all the green on this decking. The topiary and trees in this garden help to blend the boundary with the woods. And our choice of soft, off-white furnishings with only a few modern touches in no way distracts from the foliage. Just as importantly, there’s plenty of room to get around; the client’s choice of seating size was ideal and it all came perfectly together. As far as roof garden designs ideas go, this is certainly among the more interesting. 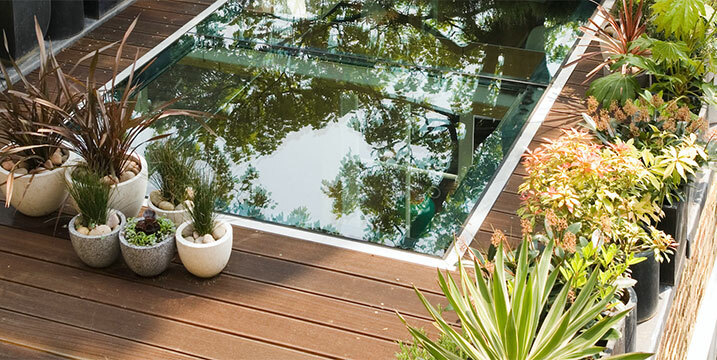 We designed this terrace around the focal point of the glass floor. And it’s intended to be viewed from above; that is, from other terraces on the property. The decking is almost a formality and is largely obscured by the pots. However, while these pots are of variable sizes and shapes, we took care to match their materials. This helps to ensure that they don’t distract from the focal point. Of course, we also took care to choose hardy plants that cope well with exposure to wind. 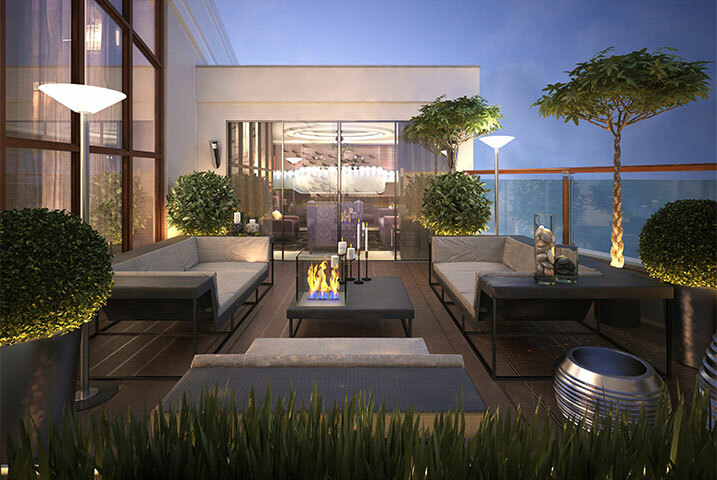 This roof terrace is another great example of how we can use carefully placed lighting to integrate inspirational ideas into the creation of a practical design. 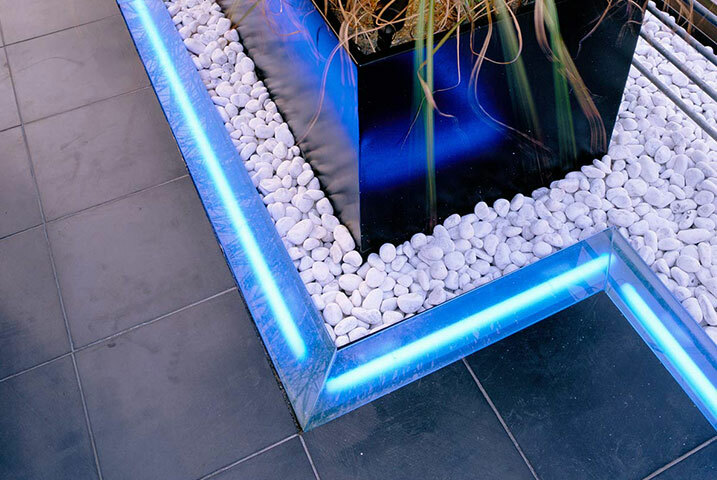 The blue LED strip lights bathe the entire space in a wonderfully electrifying glow. The ladder motif, repeated in the windows and trellis, further draws this design together, giving it a certain symmetry. But it also manages to link the terrace with the shelving in the room beyond. This was an important consideration given such an open view of the home’s interior. 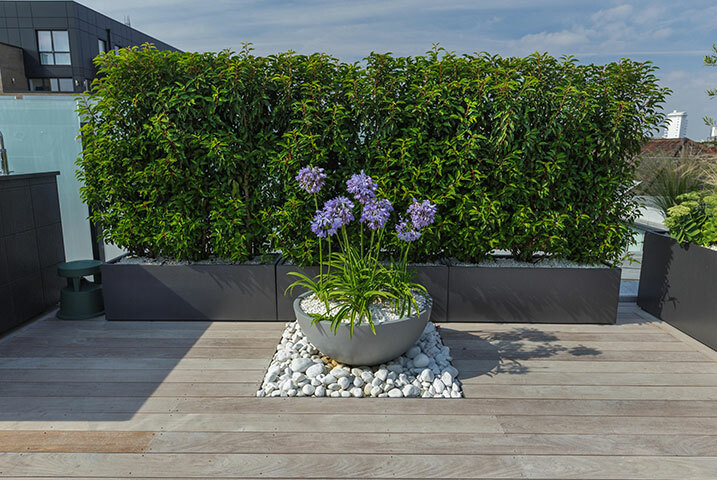 Seaside roof terrace ideas can be constrained by the limited planting options. Only the hardiest of plants can stand up to icy gales and salt-laden, drying winds. Here, we’ve de-emphasised the role of plants to focus instead on the eye-catching feature wall. We also scatter small items around a space to add visual interest. 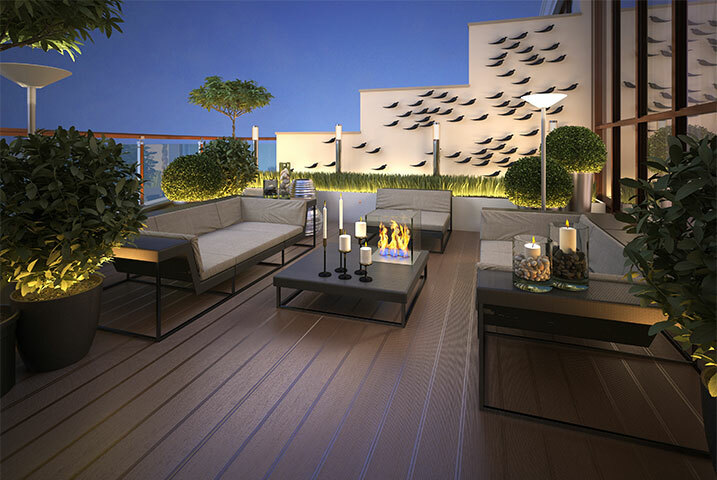 Since this roof garden design was intended for night-time use, we went with a darker decking. We also placed the seating away from the home to separate it from the indoor living space. The glass balustrade, meanwhile, ensures an uninterrupted view of the sea.